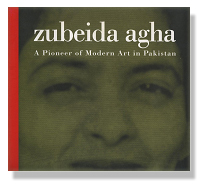 This volume on the late Zubeida Agha, who pioneered the modern art movement in the early years of Pakistan and contributed to it throughout the second half of the last century, is a joint publication of the PNCA-Pakistan National council of the arts- and the London journal AIW-Arts & The Islamic World. Its planning and production in Pakistan has been undertaken by Fomma- Foundation for Museum of Modern Art â as the second in the Foundationâs current series of monographs aimed at profiling the countryâs outstanding contemporary artists and architects. Zubeida Agha is recognized and lauded as a premiere painter of Pakistan. In the changing ethos of thirties and the forties, she had the courage and determination to launch a modern idiom of painting, which first baffled and later overwhelmed art critics and viewers. Her works spans a period of almost fifty years in which she is seen relentlessly at work to investigate new techniques, in order to reveal her aesthetic and inner worldly concerns. She is one of the great colorists in Pakistani painting. She employs colour not only for itself, but to lend veracity and meaning to her images, culled from life and restructured electronic cigarette comparison by her amazing imagination to provoke the viewer into thought. The presence of so many people who identify with the modern art movement in Pakistan today is a result if her patience and ability to explain a new concept. She was the first Director of the Gallery if Contemporary Art in Rawalpindi and part of the Committees that created the Pakistan National Council of the arts and started the campaign for a National Art Gallery. Dr Musarrat Hasan is an art historian, a teacher with a vast experience and a painter of distinction. She obtained her Masterâs degree from the Punjab University in 1961, and her PhD in Art History in 1996. She is currently Professor for PhD Studies at the Institute of Art and design, University of the Punjab, 2003. She is Supervising Professor College for Women University, Lahore, 2003.